Found a mistake? Report it now! You have a tip? Share it with us! How many did you know? The holiday season in NYC only truly starts once the Rockefeller Christmas Tree has been set up and its lights have been lit. The Rockefeller Center Christmas Tree Lighting is an event in and of itself and has been a longstanding tradition since 1933 when the first Christmas tree was put up in front of the Rockefeller Center. Many agree that although it is winter in New York City, the Holiday season does not start until the legendary tree lighting ceremony at Rockefeller Center Plaza has taken place. Last year, the Tree Lighting Ceremony was highlighted with spectacular performances by Lady Gaga, Maria Carey, Tony Bennett, and the Rockettes (a NYC dance group that also presented the Radio City Christmas Spectacular). Around 8:00 pm on December 4th this year, the huge Christmas Tree is illuminated with over 50,000 lights. The turnout for this event gets bigger every year and with it, the atmosphere gets even better. The cheer that goes through the crowd as the lights begin to sparkle is amazing and creates an atmosphere that along with the performances beforehand makes the evening a very special one. Shining brightly with thousands of lights, the Christmas tree becomes the centerpiece of the Rockefeller Plaza for the next month. With its popularity and all the buzz around its ceremony that brings Christmas to NYC, there is little information about the tree and where it comes from. 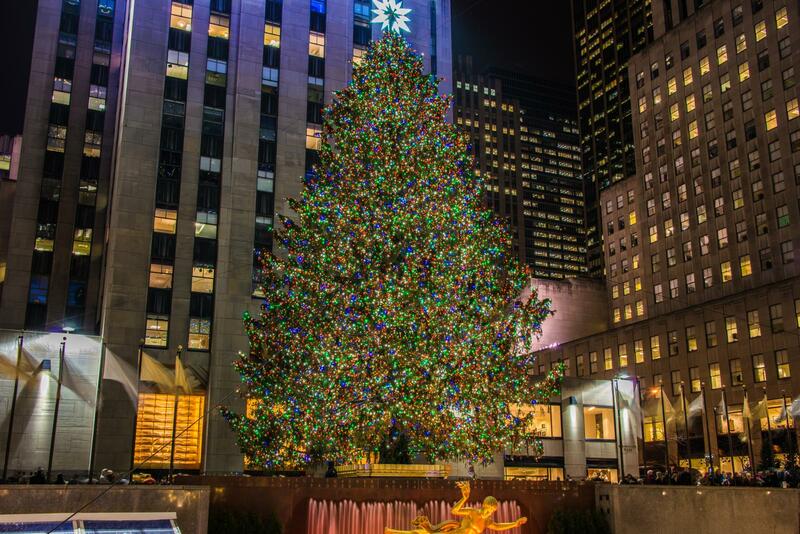 Here we have compiled a list of the top 10 facts about the Rockefeller Center Christmas Tree. 1. This thing is huge! Of course, everything is super-sized in New York City. The Christmas tree is no exception and the famous Norway Spruce comes in at a height of 85 feet. The sparkling tree weighs gigantic 13 tons. The tree branches are lit with approx. 50,000 LED lights which need nearly 7 miles of electrical wire! That’s enough wire to span once around the circumference of central park! Get personal tips & tricks, specifically tailored to your trip! 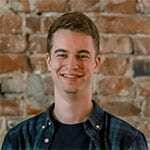 Our New York expert Moritz will provide you with individual tips & tricks as you prepare for your trip. How to plan, save money and make sure you experience the most of NYC are only some of the topics covered! When are you going to be in NYC? The only thing that could possibly outdo the thousands of lights is the sparkling Christmas star tree topper. It is made from 25,000 real Swarovski crystals and was not cheap. If you are thinking of one for your Christmas tree at home, you will have to shell out a minimum of $ 1.5 million. The spruce grew for 90 years to have the honor of being the centerpiece of NYC’s beginning to the holiday season. The first tree lighting ceremony dates to 1933 meaning the tree is older than the ceremony itself. The tree is from Pennsylvania, which is 240 miles from Rockefeller Plaza. The tree will be cut down on Nov. 9th and will arrive in midtown Manhattan on Nov. 11. On average, the Christmas tree gets 500,000 visitors a day! That comes to a total of 18 million Christmas visitors during its time as the centerpiece of Rockefeller Plaza. The tree consumes an incredible 1,297-kilowatt hours per day. These come in large part from solar cells installed at Rockefeller Center. A good thing – I don’t think anyone wants to pay that power bill! Once the lights are turned off in January, the wood of the tree is donated to charity. For many years, it was mulched and then spread throughout New York’s parks. But then doors and door frames were made from the wood and donated to those in need. Sometimes the tree was also turned into paper. No surprises here – the Christmas tree at Rockefeller Plaza is something you need to take a picture of. Standing there in its whole beauty the tree is THE photo to take in New York during the Christmas season. 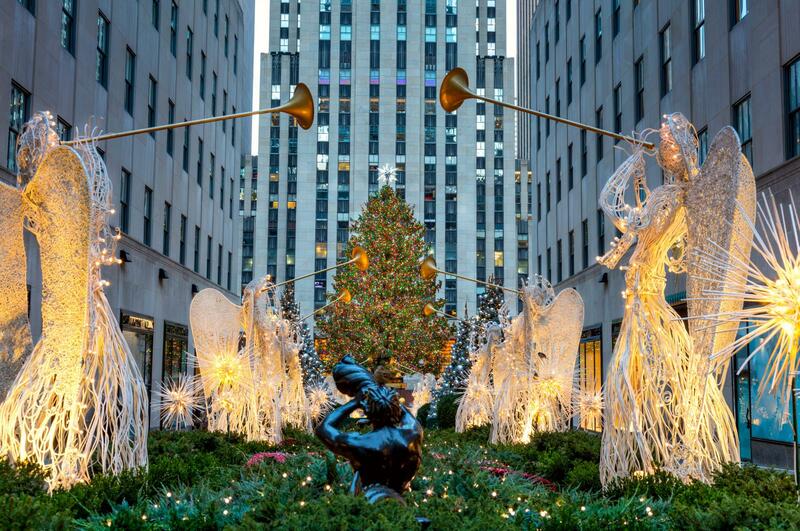 When is the Rockefeller Center Tree Lighting Ceremony? The Tree Lighting Ceremony is scheduled for December 4th, 2019. You will be able to see the tree in all its glory until the beginning of January 2020. 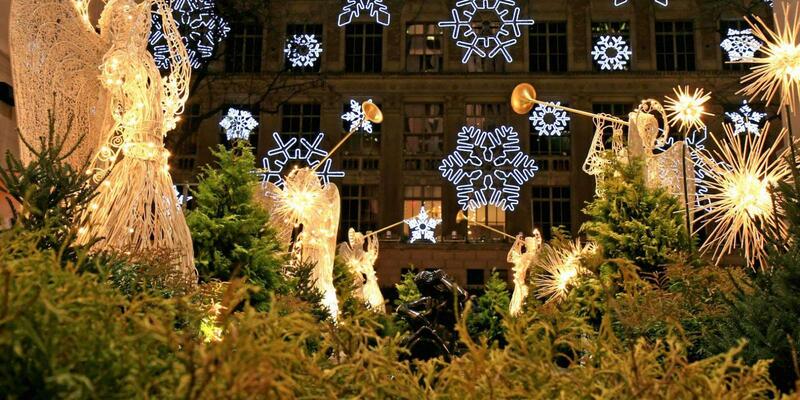 (Address: Rockefeller Plaza / Midtown West) Check out other events for the month of December here. ✅ Check out our Savings Calculator – Which pass will save you the most money? Please clarify whether the tree will be lit on Nov 28 or Dec 4th. We are planning our trip to NYC and my travel friend has never been before. We wanted very much to include this on our itinerary. This article mentions both dates. Save my name and email in this browser until I comment again. Log into myNY and start planning your New York trip. Don’t have an account? Register now - it’s free! 5 reasons why myNY will make creating your itinerary easy! Register for myNY now and start planning the perfect trip to New York City!